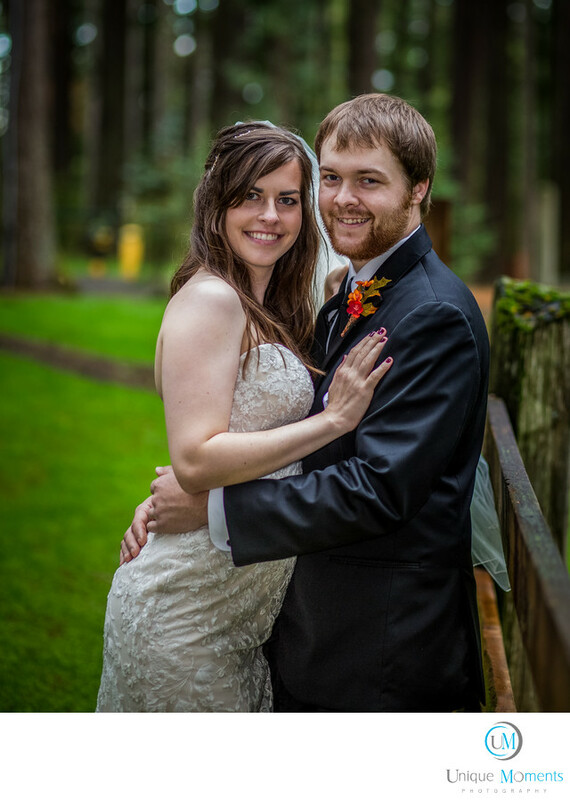 Unique Moments Photography of Gig Harbor Washington photographed this wedding in October 2015. It was definitely trying to rain but we dodged showers and managed to get all the outdoor portraits as planned. When it rains You have to work with what mother nature is going to give you. We watched the radar and managed to figure out when a break was going to happen. So you adapt and overcome. Umbrellas are a must for our area and believe or not, Wedding images with umbrellas and light rain has been done and its can make for cute photos. Frontier park was wet and it was cloudy. But the colors Popped, we could get away with very little or no flash for portraits so everything worked out well.We loved frontier park. Nice venue to have a wedding and a reception at and its equipped to handle rain just in case. Most people plan for an outdoor wedding but if showers occur, the wedding can easily be moved inside as was the case for this wedding.